A warm front will bring showers to the FLX this afternoon and evening, followed by temperatures rising into the 60s overnight. A warm front will lift north through the Finger Lakes today. Ahead of the front, dense fog is spread across the region in the wake of Tuesday’s heavy rain. Slow down and use caution traveling this morning. As this front moves in, showers will move in as well. 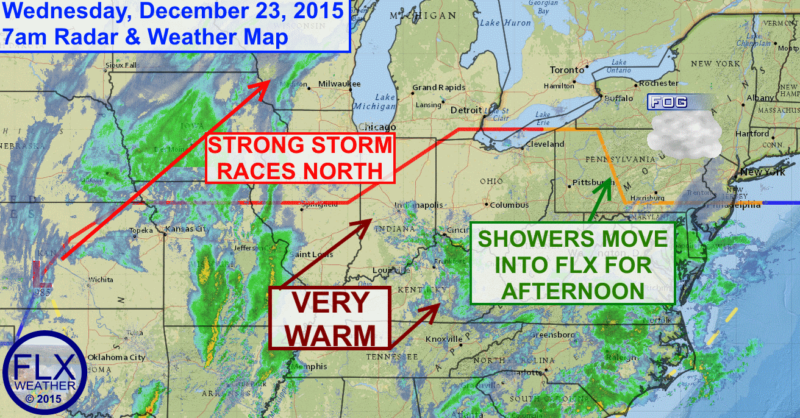 Widespread rain is already occurring across the Mid-Atlantic and Ohio River Valley this morning. Additional rain should develop as the day goes on and showers will spread into the Finger Lakes this afternoon. The bulk of the heavier and steadier precipitation will be east of I-81, but at least a few hours of showers should make it further west as well. Showers should lift out this evening as the warm front clears the region. Temperatures will rise into the mid and upper 50s this afternoon. As the sun sets, the temperatures will hold steady into the evening hours. Around midnight, the temperature will start to rise slowly. By 7am Thursday, most areas should be into the low 60s. For the eastern Finger Lakes, temperatures will continue to rise into the mid and upper 60s by late morning. However, further west, cold air will be making its return. By noon Thursday, temperatures will be falling back into the 50s for much of the Finger Lakes, while far western New York starts to drop into the upper 40s. This drop in temperature will occur along a cold front that will move across the region. At this time, it does not look like there will be much precipitation with this front, but a narrow band of gusty showers could develop. As the front passes through, temperatures should quickly drop about 10 degrees into the upper 50s, with a more gradual drop afterwards. By sunset on Thursday, Christmas Eve, temperatures should be in the upper 40s and low 50s across the Finger Lakes. Christmas Day on Friday will have temperatures in the 40s. Some late day rain may be possible, especially for southern parts of the region, but the bulk of the precipitation looks like it will remain south over Pennsylvania. Unsettled, roller-coaster weather can be expected through the weekend and into next week. Shots of cold and warm will battle for control over the region. Precipitation will accompany the changing of the air masses, and anything could happen between now and New Years. Indications continue to strengthen that much more normal wintry weather may be knocking on the door as soon as the first week of January.